We get a lot of Tiger snakes in the Fish River Valley. We were in the final stages of tasting this blend outside our roasting shed when some long grass nearby started moving, a sign that a dangerous reptile might be close. We beat a hasty retreat back to the roaster and decided that the new Blend would be named after our venomous friend outside. It has a Costa Rican base which gives a brightness along with flavours of chocolate and malt. Two great East African coffees combine to give a clean finish with subtle fruity notes from a high grade Sumatran coffee. A medal winner at the Golden Bean competition the Tiger Snake Blend has become a popular choice for cafes and home users alike. 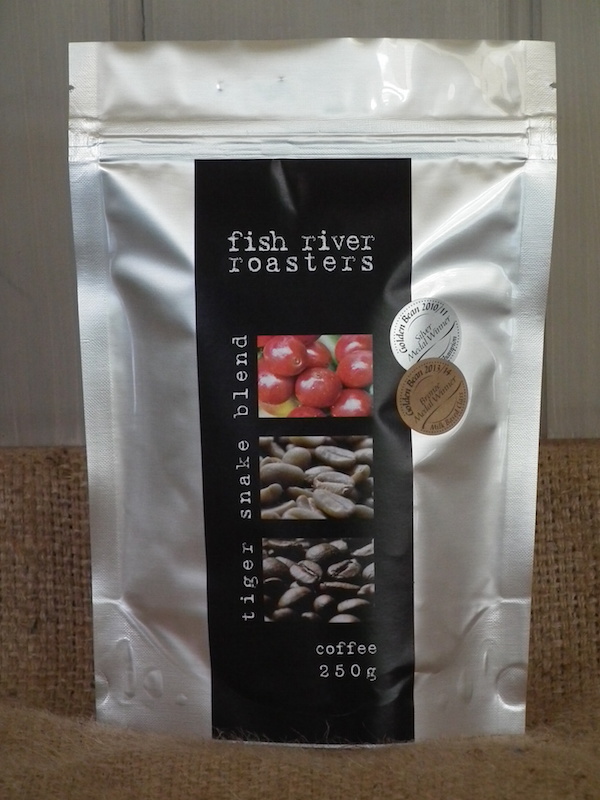 My son presented me with a bag of Tiger Snake Blend beans on Christmas day, I’m sure he’d had enough of my lousy coffee. It sat on the bench for a week until late one afternoon, I felt like a coffee hit. Opened the bag and the first thing I noticed was the aroma, how beautiful. I filled my grinder with beans and made the first shot, thinking I would have to make a couple to get that great cream on top that I love so much. But to my surprise, there is was, a fabulous cream neck on my coffee, my thoughts were, this is going to be good and of course it was pristine. So now I’m hooked on the Tiger Snake blend and I’m visiting your website to order more. Thanks for the fabulous quality coffee my son and I are now drinking and enjoying. Thanks so much for the feedback Jenet! That is very kind. The Tiger Snake has proved really popular and won a bunch of medals in competition as well.